The sun is shining, beaches are getting busier and the festival tickets are selling out. It's summer! This is one of the busiest times of year for us as we produce our Portable Ashtrays and Beach Ashtrays for the tourist industry and festival/ event organisers throughout the world. BAT Malta is using our boodi Beach Ashtrays to help a local organisation in Malta with their 'That's Rubbish!' beach campaign. 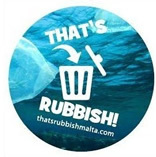 The campaign organisers have been involved with litter-picks on beaches in Malta for a number of years. Since the group was established, many more people have joined and continue to volunteer their time to cleaning local beaches. This year the boodi Beach Ashtray will be used to support the That's Rubbish! campaign by preventing cigarette litter - as it will give people an effective way to dispose of their cigarettes while on the beach. 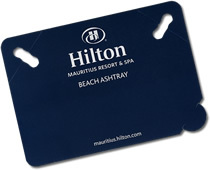 The luxury Hilton Hotel in beautiful Mauritius is using the boodi Beach Ashtray to give their clients a convenient and personal way to dispose of their cigarette litter. This helps to prevent cigarette litter and keep the beaches clean for all visitors. As it is the size of a standard postcard, the boodi Beach Ashtray can be subtlety displayed on a rack or inserted into a client pack in a hotel room. It may be a little thing, but it can make a big difference. Ski Club says "Respect the Mountain"
The UK's leading snowsports organisation, Ski Club of Great Britain, will be using the eco-friendly boodi portable ashtray for their Respect the Mountain campaign, in order to prevent cigarette litter on mountains and communicate the 'Respect the Mountain' message. Recently, UK torch supplier TacLight used boodi Portable Ashtrays to promote its range of tactical torches throughout the Airsoft and Outdoor Sports market. The eco-friendly portable ashtrays, which were branded with the TacLight logo and the line, "Need a light? ", were handed out at Airsoft skirmish sites and shooting clubs, because people who participate in these sports need tactical flashlights and gun-mounted torches and many of them actually smoke. The range of tactical torches on offer from TacLight includes high quality flashlights from Olight, iTP Light and Solarforce. New Gum Litter Solution Launched! We have recently launched the Gum Tidy - a new product to help Councils and organisations tackle the gum litter problem that persists throughout urban areas and the countryside. The Gum Tidy is quick and easy to use, can be custom printed and is both recyclable and biodegradable. Everyone should be personally responsible for their own chewing gum. However, when you need to get rid of your tasteless gum and there aren’t any bins close by, what do you do? Find a bit of tissue or paper to wrap it in and risk it gumming-up your pocket or bag? No thanks! We use the Gum Tidy. It’s small, quick and discreet to use, and doesn’t require paper. You simply open it, stick your gum onto a spot and then close it. No more sticky situations! Our popular boodi portable ashtray made appearances at quite a few festivals this year as organisers opted for an eco-friendly solution to prevent cigarette litter. The Green Police were handing our ashtrays out at Glastonbury, while festivalgoers at the Lime Tree Festival and Grassroots Festival were also handed boodi eco-ashtrays for the disposal of their cigarette butts. "Just to let you know that the ashtray went down a treat, helped us no end in not having too many butts to pick up afterwards - will definitley be in touch for next year!" After a year in development, we have launched the Postcard Beach Ashtray, just in time for summer! Essentially, it is a postcard that has been designed to fold into a perfect beach ashtray. Not only does this new invention prevent cigarette litter on beaches, it also gives advertisers and organisations the opportunity to communicate to people on beaches. Since millions of cigarettes are left on beaches every month and since advertising is very limited in beach areas, we thought we would invent a product to tackle both issues. 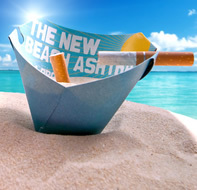 The Postcard Beach Ashtray is actually a promotional postcard that you can print on, which has been designed to simply fold into a very useful beach ashtray for extinguishing and disposing of cigarettes while on the beach. Printing is available on both sides of the Postcard Beach Ashtray, which is the size of a standard postcard (148mm x 105mm). Being the size of a postcard, it can be displayed in standard postcard display stands for easy distribution in tobacconists, bars, cafes, shops, tourist information centres, etc. New cigarette costume now on sale! The boodi team has developed a new cigarette costume, which organisations can buy to use for cigarette/ smoking related campaigns, where it will attract attention and help communicate key messages. This reusable cigarette outfit actually looks like a cigarette, can easily be adjusted to fit different sizes, folds-up neatly for easy storage and is affordable. 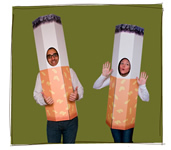 Whether you’re planning a cigarette litter campaign, a smoking awareness campaign or a PR event for a smoking related product, the cigarette costume is ideal. It comes packaged in its own box, which is small enough to carry from venue to venue. For more information, visit the website (www.cigarettecostume.com). To buy online, please visit our online shop. British American Tobacco Serbia chose the boodi portable ashtray to hand out to smokers at the 2009 Belgrade Beer Festival. Their colourful design shows what can be achieved by printing onto the boodi ashtray, and they only used 2 colours. As you can see, the ashtray can be whatever colour you want it to be, at very little cost. Visit the printing page for more information. After the great success boodi portable ashtrays had at last year's Rothbury Festival, the organisers of the four-day music event have placed a repeat order to help reduce cigarette litter this year. Sponsored by Santa Fe Natural Tobacco Company, Rothbury's printed ashtrays will be handed out to festival-goers in order to reduce cigarette litter at the festival. Made from recycled and recyclable materials, the boodi portable ashtray is perfect for music festivals and 'leave no trace' events throughout the world. At Glastonbury Festival 2009, the Green Police were distributing boodi portable ashtrays among festival-goers. The Green Police had their own unique design printed onto the ashtray, which communicated their green theme and their commitment to helping the organiser’s of Glastonbury Festival to reduce on-site cigarette litter. Being the first sustainable, eco-friendly camping complex, Portuguese holiday resort Zmar wanted the world’s most eco-friendly portable ashtray, which is why they chose boodi. Being recyclable and biodegradable, the boodi portable ashtray is ideal for use outdoors, for people camping and walking. Not only will it help prevent cigarette litter at Zmar, it will also prevent forest fires, which are caused every year throughout the world by carelessly discarded cigarettes. Santa Fe Natural Tobacco Company (SFNTC) chose the boodi portable ashtray because of its natural, green credentials - cigarettes are extinguished in the portable ashtray via tubes made from 100% post-consumer waste. The people at SFNTC liked boodi. So much so, in fact, that they also sponsored boodi portable ashtrays for this year’s (2009) Rothbury Festival in Michigan, USA.